Some online sources prefer to just outright tell you to visit Walt Disney World on a certain week or date, but that may not be possible based on your schedule. 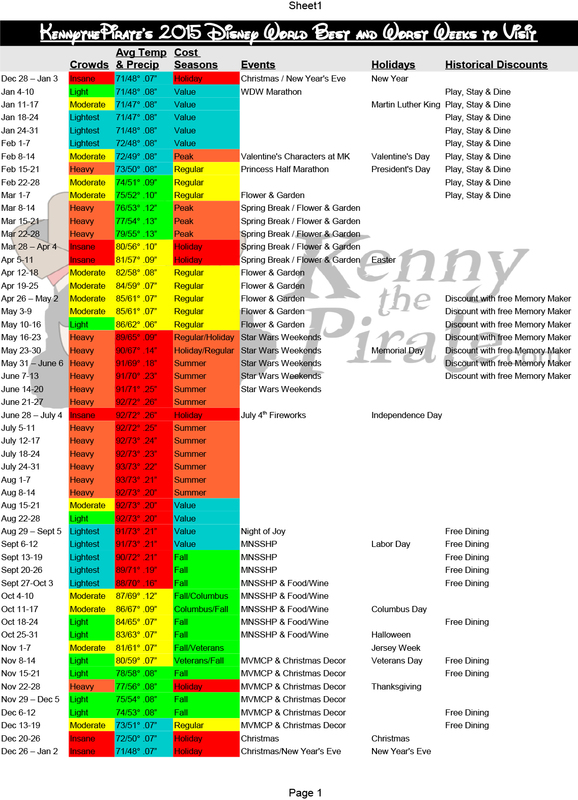 I begin each week in the 2015 calendar on Sundays and provide the blue to red chart to help you decide what the best week is for your family or what you can expect with your travel limitations. Perhaps you can only vacation when your children are out of school, what should you expect during the time frame that you select? Once you’ve made your choice of week(s) below, you might want to look over the specific Crowd Calendar for the month that you’re choosing. The Crowd Calendars provide park hours, extra magic hours, best and worst Disney World park choices, popular entertainment schedules, 180 day dining booking window, 60 day Fastpass+ booking window for onsite guests and 30 day Fastpass+ booking window for offsite guests. Can you still have a fun time when the crowds are at an “Insane” level? Yes, but a good Touring Plan is essential to your success in seeing attractions and meeting characters. This is the only source that currently provides Touring Plans that include character meets! How likely is it to rain when I visit? It rains often in Walt Disney World. The rainiest season is from June through October and it corresponds with Hurricane Season. You can expect to see some rain most days that varies from a few minutes to several hours. Bring ponchos, shoes you wouldn’t mind getting wet (it puddles badly in the parks) and an umbrella and keep moving. A number of outdoor attractions close during the rain and lightning, so find some indoor attractions. I find Epcot to be the best rain park because almost everything is indoors. Does it really feel hot or cold in Orlando? Yes and yes. Summer temperatures can reach near 100 degrees along with really high humidity. You walk outside in the summer and instantly begin sweating. Dress light, wear sunscreen and wear a hat! Does it feel cold in the winter? My northern friends might challenge this statement, but yes, it does. It’s different here due to the humidity. 50 degrees or below will feel much colder than it might elsewhere. If the forecast is 50 or less, bring a jacket and a cap. Do Holidays really affect crowd levels? Yes, greatly. You’ll find that the busiest weeks by far in Walt Disney World are Christmas, Easter and Fourth of July. Other holidays bring a bump that can bring the park levels to Heavy as well. Is travelling at a time that they offer the Free Dining promotion a good idea? Yes, you get your meals for free, right? Well, be sure to book those dining reservations just as soon as you choose your week to travel or you’ll be shut out of some of the most popular dining places, especially character meals. In addition to the Free Dining promotion, the hotels are already at reduced rates. If you are planning to stay at the Deluxe level, you might consider taking a room only discount and buying the Dining Plan or paying out of pocket (with MagicBand linked to room). What weeks would KtP travel here? Before moving to Kissimmee last year, we traveled here frequently. Our favorite times to travel were the two weeks between Thanksgiving and Christmas. Our favorite time was to split the final week before Christmas and roll over into the Christmas week. We were able to carry over the free dining plan into the Christmas week and got all the great Christmas entertainment at the Magic Kingdom for free. We could then focus out Mickey’s Very Merry Christmas Party upon the character meets and cookies and hot chocolate and feel very relaxed in our party. Another favorite time for us to travel was the week before Halloween. We could see all the great decor, check out the Food and Wine Festival, take part in Mickey’s Not So Scary Halloween Party and even meet some characters at resorts on Halloween afternoon! We have enjoyed the first couple of weeks after Christmas break in January and the first two weeks of September because the crowds were practically non-existent. How would you like to walk on Soarin’ at mid-day? We also loved traveling in mid-May to take in all the fun that is Star Wars Weekends with the special character meets and entertainment. 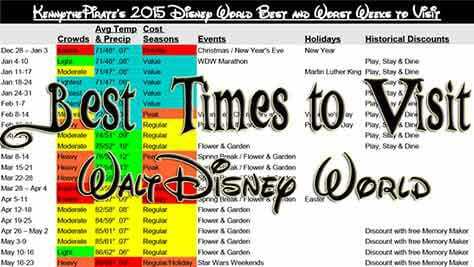 With no further ado, here’s my Best and Worst Weeks to Visit Walt Disney World chart. Feel free to comment below or on my Facebook wall.